Senate Majority Leader Mitch McConnell on Sunday defended his support for a measure in the USA Patriot Act that has anchored a National Security Agency program to collect Americans’ phone data. Speaking at the Edward M. Kennedy Institute in Boston, McConnell called the measure “an important tool to prevent the next terrorist attack,” and pledged to continue fighting for it against recent challenges. The Patriot Act’s counter-terrorism measure, Section 215, is set to expire on June 1, and McConnell is seeking to extend it through 2020. The act is at the center of a bitter controversy, with a federal appeals court ruling this month that Section 215 does not allow the NSA to collect Americans’ phone data in bulk. The USA Freedom Act, a fresh bill that would scale back the NSA’s access to telephone records, is expected to pass the House and head to the Senate, where it is opposed by McConnell. “The nation is better off with an extension of the Patriot Act than not, but we’ll see where the votes go,” McConnell said. In his talk and in response to questions from the stage by a New York Times reporter, the Kentucky congressman emphasized that his goal as majority leader is to prioritize bipartisanship and get bills passed. 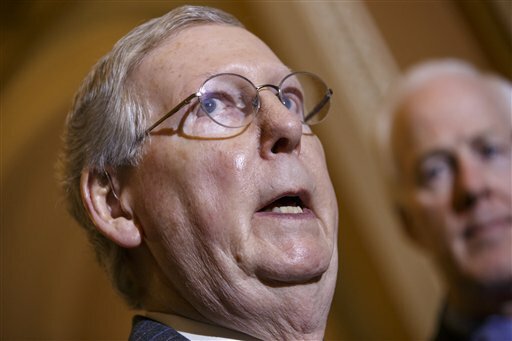 One such bill that should be passed, McConnell said, is legislation fast-tracking U.S. President Barack Obama’s authority to pursue trade agreements. McConnell said he expects to get the needed 60 votes in the 100-member Senate to pass the bill on Tuesday, contending that it is to Republicans’ advantage to give the president such powers and gamble that 2016 will put one of their own in the White House. He also praised the president for “going against type” to support the bill.